We are a couple of world travelin’ Americans who love just about everything, especially each other! Evan and Rachel met each other many, many years ago but didn’t begin dating until the Summer of 2009. That Winter, on the 5th of January, they began traveling together and haven’t looked back since! 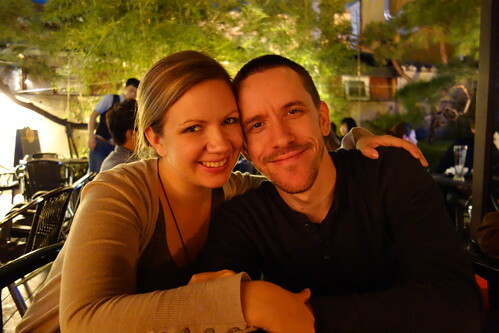 We are currently staying in one place – South Korea – working as teachers of English as a second language. We lived in Seoul for one year, and now we live near Busan, very close to the southern coast. We love it here! We travel on our breaks, and sometimes visit home back in the United States. Evan was born in Germany, but grew up in New Mexico. He moved to North Carolina when he was 16 years old, which is where he met Rachel! Evan started traveling early, obviously, and began traveling independently with his first solo road trip when he was 17. He drove an old red convertible Pontiac from Wilmington, North Carolina to Santa Maria, California. Cool! He graduated from NCSU in 2012, after taking courses on and off for nearly eight years. He speaks English, bad Spanish, and is learning Korean. Evan loves playing guitar and being a nerdy, geeky, science guy. Rachel was born in Virgina, lived a short while in Florida, and grew up mostly in rural North Carolina. She managed to avoid picking up the accent for the most part, but she can pull it out on demand! Rachel graduated from UNCC in 2009 having spent one term studying abroad in Morocco. She speaks English, French, Arabic, and is learning Korean. She is also learning to play the ukulele! Curious to know more about Evan and Rachel? Visit our Facebook Page!